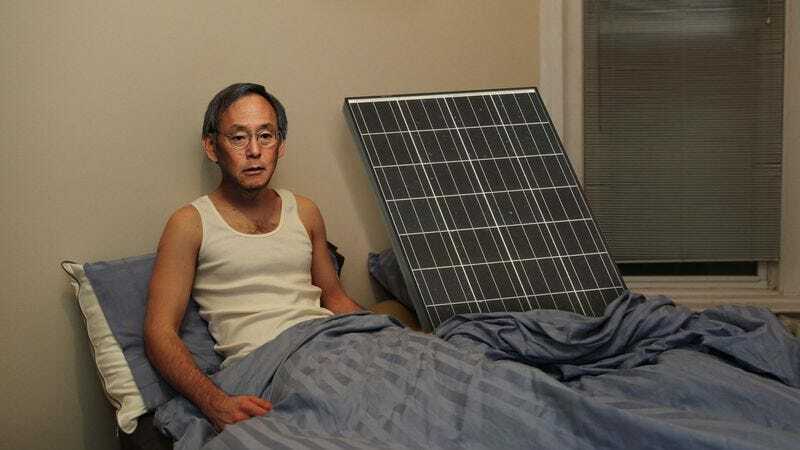 WASHINGTON—Sources have reported that following a long night of carousing at a series of D.C. watering holes, Energy Secretary Steven Chu awoke Thursday morning to find himself sleeping next to a giant solar panel he had met the previous evening. “Oh, Christ, what the hell did I do last night?” Chu is said to have muttered to himself while clutching his aching head and grimacing at the partially blanketed 18-square-foot photovoltaic solar module whose manufacturer he was reportedly unable to recall. “This is bad. I really need to stop doing this. I’ve got to get this thing out of here before my wife gets home.” According to sources, Chu’s encounter with the crystalline-silicon solar receptor was his most regrettable dalliance since 2009, when an extended fling with a 90-foot wind turbine nearly ended his marriage.